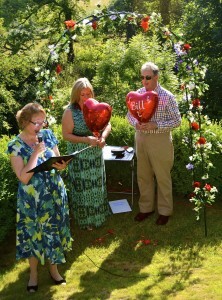 A Renewal of Vows Ceremony is the perfect way for couples to re affirm their love and commitment to one another in a personal and unique celebration to which they can invite family and friends. Some couples wish to celebrate many years of marriage together and others may have married abroad a few weeks before and would like their family and friends to celebrate their wedding back home. In some cases one of the partners has been through difficult times such as illness or estrangement and wants to start anew. I always weave into the ceremony as much personal information as you would like about your time together, major life milestones and special people to mention or remember. I will make suggestions of readings and music to help create a wonderful meaningful ceremony that will be remembered with joy by everyone. It can include: walking down an aisle, giving and blessing of rings, joining of hands, exchanging of vows, lighting of candles, Rose Ceremony, religious readings, symbolic rituals, Hand Fasting, poetry… the list is endless! Love is kind, understanding, but never demanding. Love is constant, prevailing, it’s strength never failing. A promise once spoken for all time unbroken. From the moment we met Sarah from our pre-wedding meet up I knew she would be the right person to conduct our Wedding Vow Renewal. Being terminally ill means that is was so important to get the wording just right. Making sure there wasn’t talk of the future but talk of everything we have achieved. Sarah’s words were moving yet upbeat which is exactly the type of people we are. Thank you for making our special day one that we will remember forever. Just wanted to say another big thank you. The ceremony blew everyone away especially the touches that you brought to it, bringing the Cambodian and British cultures together in such a lovely way. There were quite a few surreptitious tears too. Everyone also loved the thoughts about Alin’s family and those no longer with us. All in all, it was a marvellous day, meaningful, emotional, poignant, ecstatic and fun. Everything and more than we had hoped for. I thought you were totally wonderful.